The story of a wintertime train ploughing its way through the snow on the way to see Santa is a magical tale that truly encompasses the spirit of Christmas. And what could be found at the front of this train? A lantern, lighting the way for the express service behind it. Send Christmas ecards for business this festive season that captures this wonderful story. eCO2 Greetings business Christmas ecards present to you the ‘Snowy Lantern’ which is a beautifully thoughtful design. Just off centre on the right, a lantern can be seen, with a candle inside lighting up the dark surroundings. The lantern, covered in winter frost, sits gracefully nestled amongst twigs poking out of the snow and next to an object covered in snow. A peaceful, tranquil picture is painted, with a background of snow- and frost-covered plants and trees completing the scene. 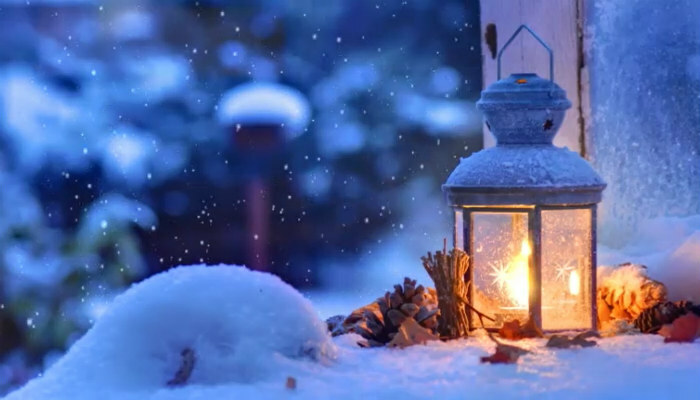 What’s more, an animated glow effect on the candle truly brings the scene to life, and falling snow only serves to further solidify this beautiful scene. A personalised message can also be added at the bottom of the ecards. Although capturing a wonderful snapshot of a wintertime Christmas scene, ‘Snowy Lantern’ may not be quite the one you’re looking for. Search our portfolio for hundreds more Christmas ecards for business and pick out the perfect ecard for this holiday season.